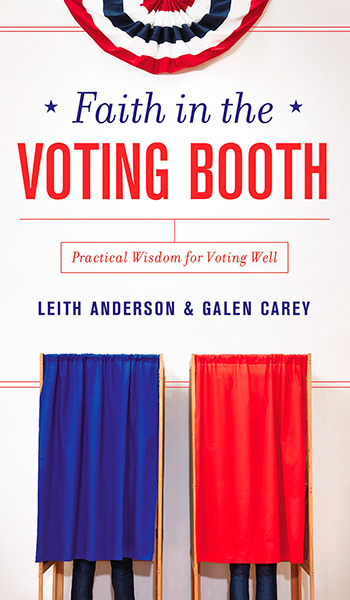 Leith Anderson and Galen Carey, Faith in the Voting Booth: Practical Wisdom for Voting Well (Grand Rapids, MI: Zondervan, 2016). Today (March 15), voters from Florida, Illinois, Missouri, North Carolina, and Ohio cast ballots in the Democratic and Republican presidential primaries. Since I am a Missourian, I performed my civic duty and cast a ballot along with them. Voting is so routine in American life that we Americans often take it for granted. We shouldn’t, however. It is a great privilege and an awesome responsibility. It also can be hard work. Choosing a candidate or supporting a referendum requires informed decision-making. What principles should guide us? What should our priorities be? Thoughtful citizens try to answer these questions as they enter the voting booth. Evangelical is “often portrayed as a political identity by the national press,” which Anderson and Carey note is fundamentally wrong. Evangelicalism is first and foremost a spiritual identity. The authors cite with approval historian David Bebbington’s list of “four convictions that identify evangelicals”: (1) conversion—having a “born again experience, (2) action—consisting of evangelism and social action, (3) Bible—Scripture is the top authority, and (4) cross—Jesus died to save people from sin. These four convictions unite evangelicals spiritually across partisan political lines. Of course, it would be next to impossible for a person’s spiritual identity not to affect their political identity in some way. “The ultimate political statement is ‘Jesus is Lord,” Anderson and Carey point out. But American evangelicals do not always let their core convictions shape their political principles and priorities. For example, Lifeway Research conducted a survey of evangelical opinions on immigration. That study found, in part, that evangelicals were as likely to be influenced on that issue by “The media” as by “The Bible” and “Your local church” combined (slide 16). For people whose core convictions include the Bible’s supreme authority, that’s an alarming statistic. The core of Faith in the Voting Booth is an examination of hot button issues from a biblically informed perspective. Anderson and Carey cite four broad areas “where most evangelicals agree most of the time.” These are biblical authority, life, religious freedom, and marriage. They then examine eight issues in more depth: poverty, racial and ethnic minorities, marriage and family, immigration, taxes, justice and jails, foreign policy, and environmentalism. The goal is to bring biblical principles and priorities to bear on public policies. Faith in the Voting Booth is difficult to peg, ideologically. For those looking for a lawyer’s brief for their side of the political aisle, this is not your book. But it’s important to remember that the Bible is not captive to modern ideologies or political parties. It stands outside of them, critiquing them for what they get wrong and affirming what they get right. If we follow the Bible, then, our political principles and priorities won’t be easy to peg as merely partisan ideology. Personally, I found the book refreshing. In a few places, it caused me to reexamine whether my political convictions are as biblically rooted as I think they are. In a few places, I disagreed with it. That kind of critical self-examination is a good habit to develop, it seems to me. The practice of Christian civility brings the fruit of the Spirit into the public square: “love, joy, peace, forbearance, kindness, goodness, faithfulness, gentleness and self-control” (Gal. 5:22–23). We please God, display the love of Jesus, and bless our nation all at the same time. P.P.S. Check out my Influence Podcast with Leith Anderson about the book. P.P.P.S. If you found my review helpful, please vote “Yes” on my Amazon.com review page. Defending the Constitution, and the Right to Be a Jerk. It’s about Terry Jones, natch. Why conservative Christians shouldn’t give Ayn Rand a pass. In case you were wondering (which I’m not): Why (Evangelicals) Love Amish Romances. This past Sunday, my wife and I watched this very interesting 60 Minutes report on Mount Athos, the heart of Greek Orthodox monasticism. As a Protestant, though, I think these guys might become more like Christ if they left Mount Athos and got involved with the hurly-burly of life. Do Christianity and capitalism clash? A plurality of Americans thinks they do. My guess is that we’d see different answers if the economy were doing better.